This article by Michael Helmstetter, Ph.D., was first published April 2, 2019, on Forbes. Aquaculture is thefastest-growing sectorin the food animal industry. The global human population will eat 30 million tons of fish by 2030, according to the United Nations Food and Agriculture Organization. The industry, however, is yet to overcome many of the technological challenges of scaling to meet this demand. It is a decade or more behind all other production animals with respect to innovation — and thus is one of the more attractive opportunities we’re seeing for agtech investors and startups alike. That said, this industry is not without its challenges. By example, AquaBounty, the inventor of Atlantic salmon that grow faster through genetic engineering, suffered through two decades to obtain FDA approval to sell its fish. The company is now poised for an IPO and we will no doubt see its product in grocery stores nationwide soon. Aquaculture is the farming (breeding, raising and harvesting) of fish, shellfish and aquatic plants (think algae) in fresh, salt and brackish waters. It has supplied the world’s highest quality source of protein to the human diet for thousands of years. Aquaculture farms (even if land-based) generally are less detrimental to the environment than traditional livestock animals like cattle or chickens. We are also seeing row crop farmers, motivated by consistent low commodity prices, convert land from traditional plant and animal operations to aquaculture facilities. More recently — relatively speaking — the pollution associated with the Industrial Revolution disrupted natural migrations and paths of waterways, and the Green Revolution of the 1950s and 60s caused land-based agriculture and ranching to develop more rapidly as an industry. Aquaculture practices continued in developing countries, but the West largely ignored them until recently. Here in the U.S., aquaculture was, until a few decades ago, largely focused within the halls of scientific research. In the 1980s, I ran an aquaculture facility that bred and grew rainbow trout for cancer research (as an alternative test species to mammals). It was during this time that transportation deregulation and biotechnology advances were birthing the massive biotech-fueled ag industry we know today. At that time, I had no concept that aquaculture — including fish just like those reared in my trout operation — would develop into a$150 billionindustry. Fast forward 20 years, to the turn of the century: For the first time in recorded history, more thanone million tonsof farm-raised salmon were produced. Europe and the U.S. were reacting to middle-class consumer demand for sustainably grown, natural aquaculture fish. Today, farmed salmon, tilapia and shrimp have found huge worldwide markets. When it comes to innovation, however, aquaculture is still a decade or more behind other livestock industries. I was recently in the UK at an aquaculture innovation conference and found that the event was well attended by multinational companies looking for innovation solutions to aqua challenges, yet the innovation supply highly disappointed the demand. The challenges are significant. 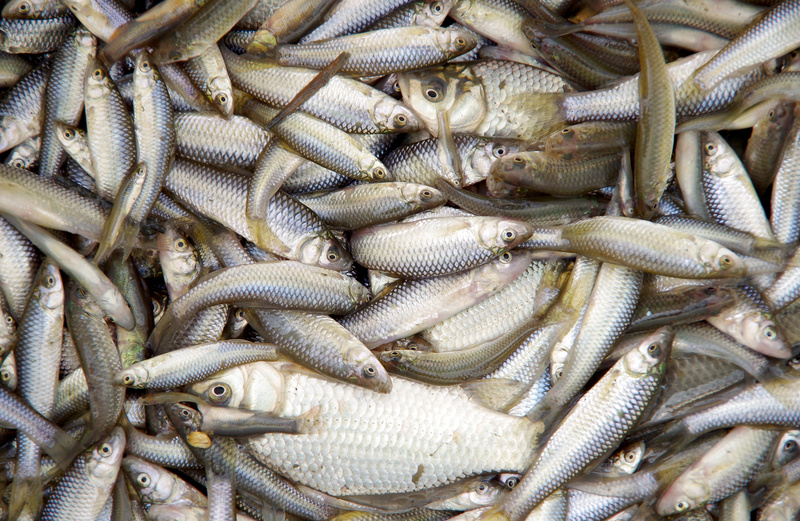 In some species sectors, such as farmed tilapia and shrimp, disease losses may account for a staggering40% of aquaculturevolume. And, about 33% of wildglobal fish stockis fished beyond sustainable levels, and climate change is threatening the health of entire aquatic ecosystems. The aquaculture industry must respond. Another of the significant challenges is fish meal — fish raised to be fed tofarmed food fish and land animals, such as pigs and chickens — is still caught from oceans, rapidly accelerating depletion. The industry is outgrowing its feed supply. Several startups and industry R&D programs are looking for alternatives to lessen overfishing impact while providing a high-protein meal. And when fish fall ill — for example, parasitic sea lice are a huge problem in salmon farming — treatment methodologies remain cumbersome and unclear. Do you broadly bathe the ill fish in medicine, unsure of the actual exposure and treating healthy fish as well? Do you capture the sick fish, anesthetize them and manually inject a treatment? Manually vaccinating fish is an arduous, slow and expensive process but is commonly used today. In 2015, Zoetis, the world’s largest animal health company acquired PHARMAQ — a fish vaccine company — for $765 million (U.S.) with the vaccines manually or machine injected. These are only a sampling of the many quandaries facing aquaculture today. The innovation gap is huge: how do we go from a cultivation regimen stuck in the 1980s to a massively scalable, sustainable, $150 billion industry? In terms of fish consumption, all trends point upward. World fish production is expected to see sustaineddouble-digit growth. There is an enormous need for innovation and high-risk capital to fuel the change. We’re already seeing advancements in terms of new ways to deliver vaccines (full disclosure: this is an area TechAccel is actively investing in), new types of fish food (such as black soldier flies and mealworms) and developing fish and shellfish that are more tolerant of stress associated with changing conditions. Such research and development is coming right in the nick of time: the FDA only recently completed its regulatory infrastructure for aquaculture fish, and the UN estimates that one-third of the world’s oceans are alreadyoverfished. There is hope on the horizon in the form of new startups, accelerators and venture capitalists focused on international aquaculture. For existing enterprise players, and those looking for new types of agtech opportunities, there is no better time to learn the value of aquaculture to the evolving world population, how aquaculture works and the associated risk/reward, and the encouraging economics for innovators, investors and animal health industry leaders.